Taking on responsibility for managing people at work is one of the biggest career steps you’ll make. But taking that further to having responsibility for leading in the business, well that requires an extra set of skills and a bit more knowledge. I’m Anne-Marie Burbidge and I can help you build the knowledge and skills you need to be great at work. The career transition from being responsible for just you, to also having responsibility for a team of people (whatever size) is one of the biggest career steps you will make. Its a massive learning curve, and not everyone gets the support and development they need at exactly the right time. It can be lonely being a people manager, it’s likely that you are the only person doing exactly your job, you may be new to the business or you could be managing people who were once your colleagues. We all want to do well at work. We want to be successful, whatever success looks like to you. When we are responsible for managing people, we all have good intentions to support, inspire and encourage our people, leading by example, offering challenge, feedback and development opportunities, and managing performance effectively. When you rise to a leadership role, you need to maintain this, but your focus needs to shift a bit to include a wider vision of the business, and you need to inspire people to follow your leadership, not just do as they are told because you are the boss. It’s worth noting that being a leader doesn’t necessarily come after being a line manager - some careers are organisations don’t work quite that way. And plenty of leaders aren’t people managers. There is also cross-over between the two. I just googled this question and got over 1,570,000,000 results, with thoughts from everywhere including academic texts, business, bloggers and psychologists. The theme that seems to run through most of the writing is that mangers have an operational function, and are responsible for setting goals and making sure they are achieved. Leaders have responsibility for motivating, inspiring and setting direction. Its wider than your immediate team. 1. What do you think are the differences between a manager and a leader? You need to be able to define what management and leadership means to you, this will help you feel comfortable with the role, and keep your actions authentic to you and in line with your values. From your boss and the business, what does a good leader do where you work? Do you have competence frameworks, role descriptions, values, mission statements, purpose statements, organisation objectives, a vision? What clues do these give you about what management and leadership look like where you are? If you don’t have these documents, ask the question. Ask your manager, your peers, your team, HR - what does good management and leadership mean to you? What behaviours are rewarded where you work? Be open with people about stepping up in your role, and wanting to do as good a job as you can, and ask what they want/need from you. Now you know what good looks like, how are you currently doing? You’ll have your own thoughts on this, but get a more rounded view. Ask people you trust what they think. Feedback should be developmental, you should learn from it - good or bad. By being open to giving and receiving feedback you raise your awareness of your skills and gaps and create a safe environment in your team where you share successes and failures, and learn from them. Do this regularly, have regular debriefs, meetings, chats, reflections, make it part of the everyday, part of the expectation. 4. Look for role models, good and bad. Who is doing this well? Who is doing it not so well? Have a look in your organisation, your industry, and wider. Who is managing well? Who is leading well? What are they doing? What can you learn about what good managers and leaders do? What mistakes are the unsuccessful ones making that you need to avoid? Perhaps try filling in the template below so you build a clear vision of what success could look like. Try and think of behaviours, so for example not simply ‘encourages high performance’, but what does that involve; giving timely balanced feedback, setting clear goals and expectations etc. Now you know what good looks like, how do you measure up? Be honest but gentle with yourself about this, you’re learning. 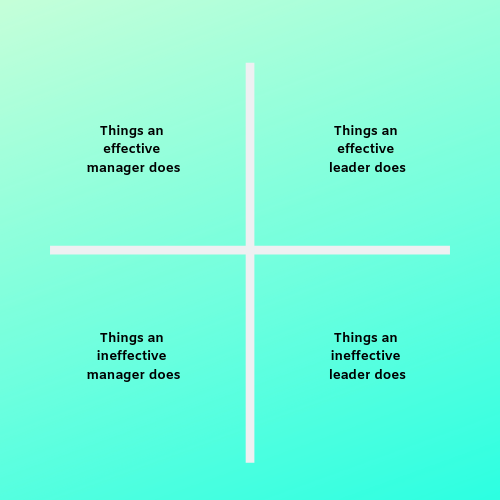 Use your completed grid above and think about what you can do to move from ineffective to effective, and manager to leader. What do you already do well, what do you need to work on? What skills do you already have, what do you need to learn? How does the concept of ‘leadership’ interact with your values? What makes you prickle? What are you most comfortable with? What is important to you, and how can you magnify that and use it to motivate, inspire, encourage and challenge your people. And, do you have any inner gremlins are talking you out of this? Call them out. The longer they carry on saying you can’t do this (or anything else that is unhelpful! ), the more you will believe them! Does that word make you cringe a bit? I’m not talking elevator pitches and stand up introductions, but you need to understand the whole business, not just your bit. Get to know people and what they do. What are the priorities and challenges for the different areas of the business? What is each departments role in achieving the business objectives? Build relationships. Chat. Listen. Offer to help with something. Can you join some different meetings to learn more about what is going on? Attend inductions or on boarding workshops to see what new joiners are hearing about the business. Look at the reasons people give for leaving. Remember, a manager may have direct line management responsibility for a team of people, a leader is expected to have a wider impact on the organisation, you may be both - how can you scale up what you do? You have made it to this level in your career because of your professional capability and your people management skills, how can you do this on a wider scale? What opportunities are there? Good luck, and if I can help at all please do get in touch, there’s no obligation! I work with organisations, businesses and people individually, all with the aim of building confidence, capability and clarity around work. My career started in a hotel, arrived at Buckingham Palace, and went via an airport and a Lancashire truck yard. But it’s always been about people; selecting them, developing them, listening to them and challenging them to solve problems and be great at work.